Spring is here!!! Well... at least that is what I keep telling myself. Truth be told, this week I've considered packing up, leaving this frigid San Diego and moving myself somewhere tropical and steaming with hot humidity. Yes, San Diegan's are somewhat, shall we say, "sissified"? Dip those daytime highs into the 50's and out come the jackets, hats and gloves. Throw on a scarf and you might stay warm. Something called a "cold front" has blasted through my little coastal surf town, and as a girlfriend and I faced the gale force (30-40 MPH) winds for our beach walk yesterday, that nagging thought of moving tropical was looking more and more like a better option. This morning's early morning temps left frozen grass in the front yard and two chilly Maltese pups snuggling close together in their bed with no desire to head outside to freeze their tender little paws. Cranking the heat and wrapping my scarf (yes... in the house) just a tad tighter, I set to encourage the Spring Gods as best I could. Pulling out my Christmas Gift, a bright and shiny new Double Belgian-Waffle Maker , the kids rose to aromas of freshly baked waffles. Having experimented over the last few weeks, I've discovered that my usual waffle recipes don't pair well with the Belgian maker, and a higher fat content seems to be key to crispiness along with a very thin batter. 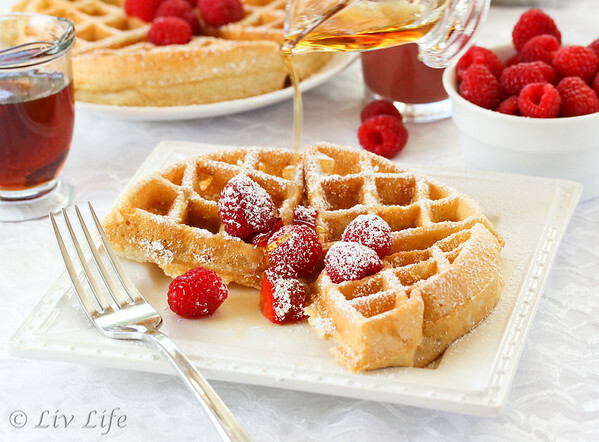 With this new successful recipe under our belt, we soon found ourselves topping our perfectly crisped waffles with berries, syrup and a dusting of powdered sugar (representing snow...), and spring almost seemed a glimmer. Either that or the heat in the house was finally warming us up. The Belgian Waffles we know today, are in reality an American creation, though they do have roots in Brussles. 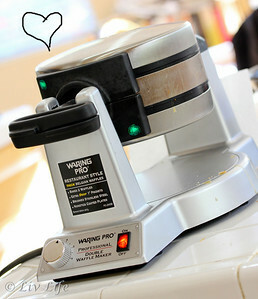 Belgian Waffle Makers feature deep grids which in turn create deep pockets in the crispy finished product. 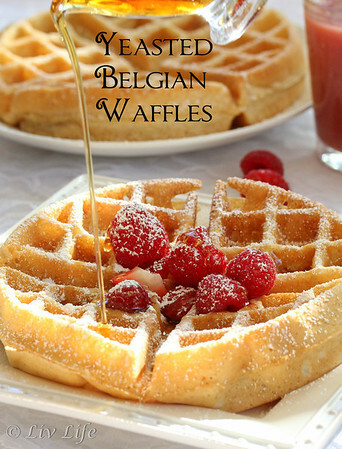 Belgian Waffles are noted for their golden, crispy outside and creamy-like, moist interior. The Belgian version typically uses yeast in place of baking powder, making it necessary (but OH, so worth it!) to plan ahead. We whisk up our batter the night before, and in the morning with the batter already prepared our waffles are done in no time. Searching for waffle recipes after I received my maker for Christmas, my heart sank as recipe after recipe came filled with high contents of oils, butters and white flours. While I don't mind such splurges on occasion, these recipes won't do for me as a "good start to the day" breakfast. Adapting numerous recipes into our version below, we've added whole wheat or spelt flour to increase fiber and protein, replaced whole milk or cream with skim or rice milk (for our lactose intolerant family member), and decreased the amount of oil or butter to reduce saturated fats, all while still maintaining the ever popular and traditional golden, crispy crust. Toss a few berries or bananas and nuts on top of your waffle and you have a decent start to your day. In a large mixing bowl, combine the flours, flax (if using), yeast and salt, whisk to combine. In a medium bowl, add the oil or butter, sugar, milk, eggs and vanilla. Whisk vigorously to blend. Add the wet ingredients to the dry ingredients, whisking vigorously again to combine thoroughly. I give it a good 1-2 minute whisk (it's good for your arms! ), or use a hand mixer to combine. Note: Your batter should be thin. Add a bit more milk if too thick. Cover with plastic wrap and refrigerate several hours to overnight. When ready to use, remove from fridge. Heat up waffle maker and follow waffle maker directions. Top with fruit, nuts or a simple pat of butter along with syrup and powdered sugar if desired. Enjoy! 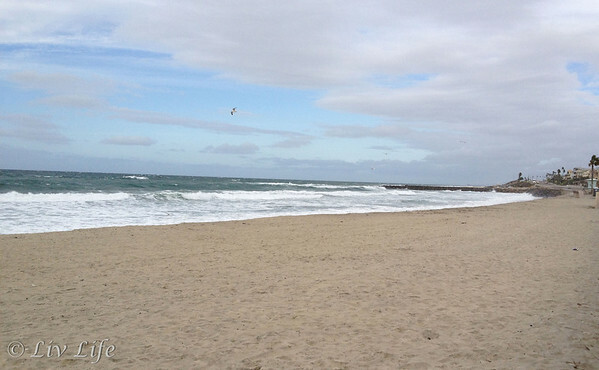 One VERY cold and empty San Diego beach... winds at nearly 40 MPH sent sand stinging across the face and a chill directly to my bones! 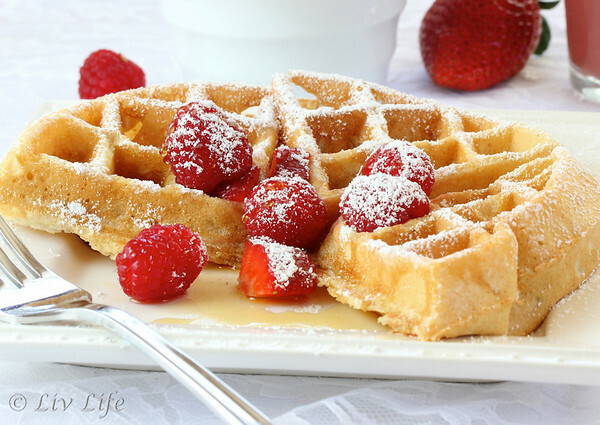 I usually make waffles on a whim, which means I've only ever made the baking powder kind... but I think I might just have to learn to plan ahead for a change, because these look so perfect and golden-crisp - especially since you've made them over to be just a little less guilty. Love it! We're not even going to discuss winter in New York. :) Those waffles looks so, so good. You're making me wish for a waffle maker! Take me, take me, lol. I think I have a case of S.A.D., also sad I didn't have waffles for breakfast. I think that would have made me chipper all day. Let's keep all our fingers and toes crossed Spring will be here soon. These look yummy and perfect for our winter...in Moscow! Found your recipe on Pinterest. Will give it a try! 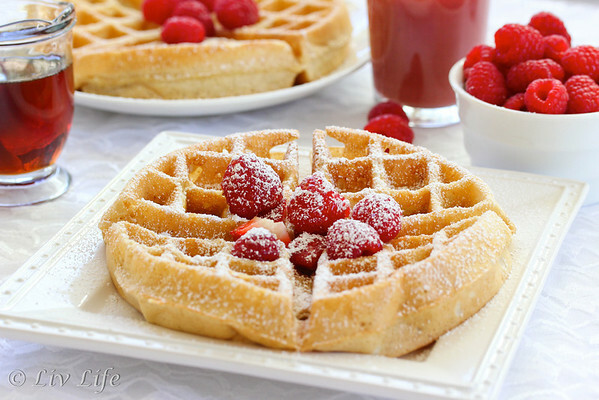 Waffles are SUCH a weakness for me.. these look excellent. I was lucky enough to go to Belgium and waffles are truly the best. When I got home I bought the double waffle maker and began my quest. Better Homes and Gardens waffle is the best I've found. Can't wait to try yours,as it looks much healthier. How many waffles did you get? I have a similar machine. We get about 6 full sized waffles! which beach is this...?....Moonlight or Cardiff or Solana or DelMar?